Practice Area: Grass tee driving range and a chipping / putting green. Description: This semi-private club is located within earshot of Charlotte Motor Speedway and you'll know it if you play during a race week. 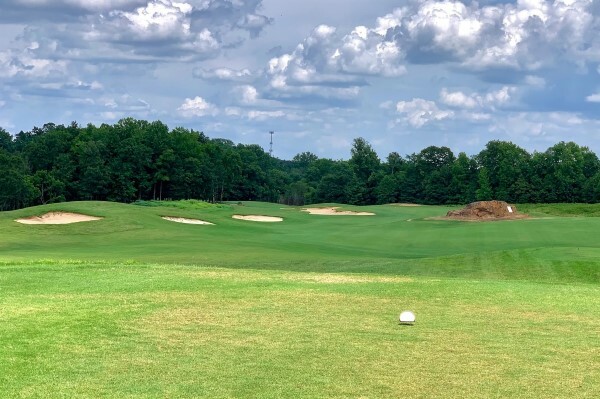 Designed by Dan Maples and managed by the Embassy Suites-Concord, the course offers stay and play packages similar to a resort course. The clubhouse offers nice views of the 18th green from the Stonehouse Grille. With several risk-reward holes and the amenities, this course is a great place for an outing. The greens were redone in bermuda grass during the summer of 2012. Notes: Good selection of affordable, annual golf plans, including discounts for Concord residents. B-Man's Take: I now play here regularly a few times a year. It's typically kept in very nice shape and the staff and amenities are top-notch. It's also fun to play when something's going on at the race track -- the Zmax Dragway stands now rise over the clubhouse and driving range. The course has many unique and memorable holes, including the 555yd par 5 3rd hole with a huge boulder smack in the middle of the fairway. With the conversion to bermuda grass on the greens in 2012, the course remains in great playing shape almost all year round. I enjoy the challenge and scoring opportunities at Rocky River -- I nearly aced the 10th hole (missed by inches) in July 2014.